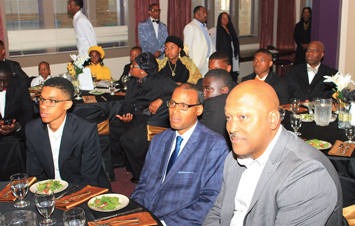 Friends and supporters of student Minister Keith Muhammad attend tribute in his honor. (R) Student Minister Keith Muhammad of Muhammad Mosque No. 26B was recognized for his 27 years of work in Oakland. OAKLAND—It was a night to be remembered. 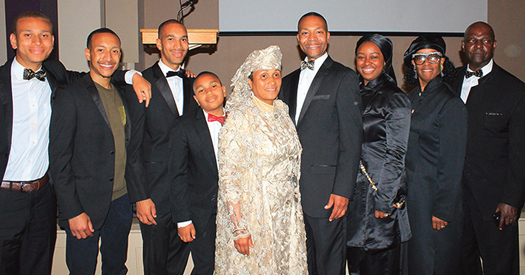 Families, men, women and children traveled from near and wide to celebrate the legacy of a minister, a man and a Muslim. Student Minister Keith Muhammad of Muhammad Mosque No. 26B in Oakland was honored and recognized for his 27 years of labor and work during a recent ceremony and tribute. Numerous testimonies, words of admiration and appreciation about the works of Student Min. Muhammad were shared from Muhammad University of Islam (MUI) students, Believers across the nation and community activists. The tribute was held at the Preservation Park Victorian Home dining room. Pastor Wanda Johnson (mother of Oscar Grant, slain by a BART police officer in Oakland) was one of the first to arrive. Shortly after, many familiar faces in the fight for justice arrived, including Oakland City Council member Desley Brooks, County of Alameda Supervisor Keith Carson, Donald Lacy, (father of Loesha Lacy slain by a 16-year-old), former Black Panther member Elaine Brown, Student Minister Christopher Muhammad of Muhammad Mosque No. 26 in San Francisco, Jumoke Hinton-Hodge, member of the Oakland Unified School Board, members of the Love Not Blood Foundation and a host of community leaders and pastors. 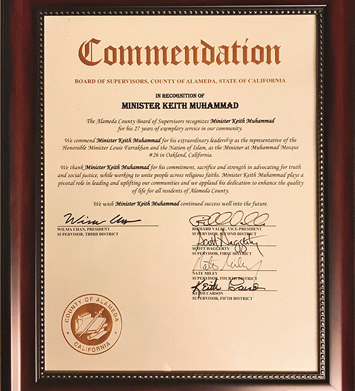 “In recognition of Minister Keith Muhammad, the Alameda County Board of Supervisors recognizes Minister Keith Muhammad for his 27 years of exemplary service in our community. Oakland City Council and the Alameda County Board of Supervisors presented commendations to Student Min. Muhammad. The ambiance during the evening was amazing. The Preservation Park Victorian Home dining room was transformed into an elegant backdrop for the occasion. The tables were draped in black table cloths with accents of gold, white and black flower petals. The plates were trimmed in gold with platinum level food prepared and served by the MGT and GCC (women of the Nation of Islam) of Oakland. As tables began to fill with friends and family of Student Minister Muhammad the joyful mood in the room was palpable. One MUI student, Salaudin Abdul Rabb Muhammad, testified that Student Min. Muhammad was a minister, father, brother, role model, counselor and a guide to the Oakland community. Student Min. Christopher Muhammad of San Francisco. (R) Community leaders, activists and friends shared stories and testimonies on the dedication and work displayed by Student Min. Keith Muhammad in the city of Oakland over the last 27 years during a recent evening honoring his impact in their lives and others. Student Min. Muhammad’s four sons then presented him with a beautiful gold watch and shared warm words and testimonies of the man they know at home being the same man they know publicly. “I never heard my father raise his voice to my mother or any woman for that matter,” said Salih Muhammad, as the room erupted with thunderous applause. This was what the Student Minister Keith Muhammad witnessed by many. His family, including his wife, Salamah Muhammad, all described him as a humble Muslim who rose above emotion into the thinking of God. Student Minister Christopher Muhammad of San Francisco’s Muhammad Mosque 26 followed with testimony that invoked laughter, while making key points that emphasized the arduous journey of a tumultuous terrain in the city of Oakland. “Oakland is a tough city, but you needed a measured, wise, disciplined, humble, patient, loving servant to balance the rough and tumble of this city. Student Minister Keith has worked in the best manner. He has overcome all the negative imagery that the enemy tried to project us and portray us in,” said Student Min. Christopher Muhammad. Toward the end of the night Student Min. Keith Muhammad delivered his own brief words that mostly focused on his gratitude to Allah (God) for allowing him to help Min. Farrakhan.